This first release by America's premier psychotic weirdo duo was described by Objekt magazine as "Music for the insane asylum/ lobotomy ward". 60 minutes of dreary, croaky voices chanting and spewing out disjointed texts about isolation, alienation and mental disease -- everybody's favorite subjects. "Une cassette dense... dure a entendre... mais necessairement a ecouter..." (Open System Project). Titles include "Drifting Into Sync", "The Message", "Slipping Away", "She Wants To Forget" and others. Excruciating minimalism, great for quaalude parties." In A Foreign Film was the first full-length tape that Debbie Jaffe and Hal McGee recorded and released under the name Viscera. Industrial gothic minimal synth avant neo-primitivism. Most of the songs consist of abstract and expressionist poetic texts recited with a sparse instrumental backing of Casio MT-11 and VL-Tone keyboards, clarinet, Boss Dr. Rhythm DR-55 drum machine. Recorded at 821 N. Pennsylvania Street, Apt. #22, Indianapolis, Indiana, in 1982. Originally released by Mirth and Merriment Productions, on cassette in 1983, C59; re-issued by Harsh Reality Music in 1990; and HalTapes since the mid 1990s.. The equipment Debbie Jaffe and I used was primitive, but was a step up from 60 MINUTES OF LAUGHTER. Along with the tiny toy-like Casio VL-Tone, we had a new Casio MT-11 polyphonic keyboard. We had recently bought a Boss Dr. Rhythm DR-55 drum machine, just like the one our friends Rick Karcasheff and David Mattingly used in their band Gabble Ratchet. Deb played clarinet on a couple tracks. We performed most of the vocals using our Shure vocal microphone through my guitar amplifier. We used the amp for the keyboards too. All of the pieces on IN A FOREIGN FILM were recorded with an Audio Technica stereo microphone directly into our Pioneer CT-F750 cassette deck, which had stereo mike inputs on the front. It was an odd time. Deb and I were living in a hole-in-the-wall $130-per-month apartment in a crappy old building in downtown Indianapolis across the street from the Public Library. We lived there from the Summer of 1982 through early 1984. Apartment Number 22 at 821 North Pennsylvania Avenue was dinky, essentially one room. We prepared our meals in a tiny kitchen which had a gas oven which was always on the verge of blowing up. The bathroom area had one of those old-time footed bathtubs. The plaster and wallpaper were flaking and peeling off the walls. The apartment was hot in the Summer because there was no air conditioning. In the Winter we got heat from an ancient rickety steam heat radiator. We could not afford a telephone, so we went across the street to the Library to use the pay phones. The apartment was overrun with mice and cockroaches. Downtown Indianapolis was a depressing place to live. There were a lot of direfully poor people living in rundown buildings that had once been luxury accomodations before all the wealthy people abandoned them and moved out to the suburbs on the north side of town. There were hundreds of homeless people living in alleys and condemned buildings, foraging for scraps of food in garbage dumpsters and trash cans in fast food restaurants. Within a few blocks of our apartment were several mammoth, gray, icy-looking war memorials made of huge blocks of Indiana limestone. Winters in Indiana can be bitterly cold, with harsh winds that can drive the wind chill temperature as low as 70 degrees below zero Fahrenheit. Sometimes we almost literally did not see the sun for six months at a time, as gray clouds blanketed the sky from October through March. It is little wonder that I sank into bottomless pits of lethargy and hopeless depression for months on end. I was unemployed a lot of the time. I resorted to temporary jobs and collecting discarded cans for money. Deb had spotty employment, but at least she could type, so she got odd jobs at various offices downtown. We were on the U.S. Department of Agriculture food stamp program for about a year. I had a lot of emotional problems. A couple of years before, in about 1980, I had been diagnosed as schizo affective schizophrenic. I was told that this condition was caused by a chemical imbalance in my brain and that this might very well be hereditary. I was in psychiatric counseling and took prescription medications (Lithium, Stelazine and Activan) that were intended to derail the psychological rollercoaster I was on: from stratospheric emotional highs to the depths of suicidal despair. They did the job so well that I felt like my consciousness was in a box. Instead of calming me down this had the effect of making me more anxious, because I felt like my mind was in a prison. Debbie and I were broke and depressed and both more than a little crazy. But there will never be another time like it. Our intuitive collaborative powers were at an all-time high (a truly invigorating, joyful, creative feeling!). We knew each other so well that we could complete each other's sentences. The bed, floor and chairs were littered with hundreds of books, tapes and scraps of paper on which we had written poems, tracts, manifestoes. The words poured out of us as we tried to make sense of our lives and the struggle of existence. Rick Karcasheff had made dozens of tape copies for us of intriguing recordings by underground audio artists from all over Europe, Japan, Canada and the U.S. It was around this time that we first learned that there was a worldwide network of people who made recordings in their homes of their own electronic and experimental music. This was an exciting time because we were finding out all about the hometaper scene. 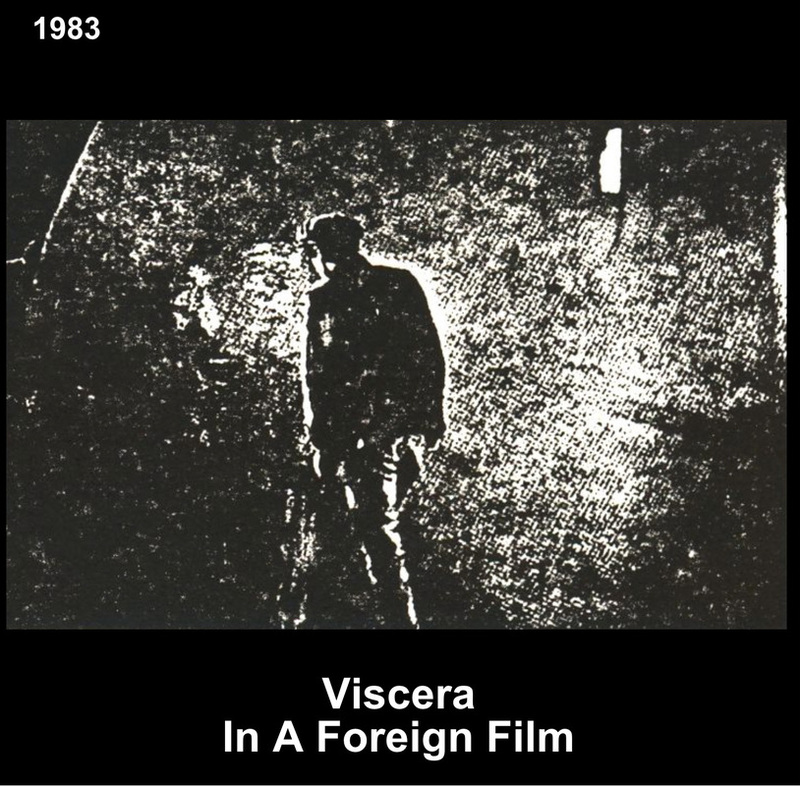 IN A FOREIGN FILM by Viscera was the first tape we did that we sent out and traded with other audio artists. Deb and I set about making our own unique and very personal audio statements. One of us would choose a poem or other scrap of writing by one or the other of us that we found lying about or in a notebook; the other would search for a sound setting on one of the Casio keyboards or a simple pattern on the drum machine. Then, with little or no preparation or advance planning we would turn on the tape recorder and let it flow out of us! We filled up several cassettes with these spontaneously created sound works. In a way they were like miniature audio theatrical pieces. We chose to use the name Viscera because we wanted to create works that were as direct and straightforward and from the gut as possible. We strived to scrape away artifice, to get to the root, the core, the essence of existence, to baldly express our personal sense of the politics of experience. What did it mean to exist? I had the sense that existence itself was suffering. I also believed that each person must find his own personal vision and meaning (if any) of life. We both believed in the power of art to redeem life of its seeming meaninglessness: all the boredom, confusion, contradictions and pointlessness of existence. If life was hell and if absorption in self was hell, then Viscera presented windows into that hell! Yes, it is true that I had read a lot of existentialist literature: all the Dostoevsky (Crime And Punishment, The Idiot, The Brothers Karamazov), Camus (The Stranger, The Fall, The Plague) and Kafka (The Castle and The Trial). Samuel Beckett's bleak vision of a meaningless world in Waiting For Godot had made a big impression on me. The dystopian visions of William Burroughs had convinced me that reality itself was a vast conspiracy of cosmic proportions. I could not get enough of Ingmar Bergman's films (Cries And Whispers and Persona were my favorites). At this time I favored music that presented a morbid, pessimistic view of life (Joy Division and early New Order, as well as Throbbing Gristle, Cabaret Voltaire and a little Nico). And, in 1983 we got Kent Hotchkiss's Aeon Distribution Service to carry it! -- wow! -- what a coup! -- now we were in the Aeon catalog along with people like Nurse With Wound, Whitehouse, Borbetomagus, Human Flesh, Nocturnal Emissions, Legendary Pink Dots, D.D.A.A., P16.D4, Pascal Comelade, Mnemonists, Lt. Murnau, Maurizio Bianchi, etc. We felt like we had really arrived! The album We Buy A Hammer For Daddy by The Lemon Kittens (United Dairies label) had an enormous influence on our style. IN A FOREIGN FILM may be a difficult listen for many people. The singing/vocalizing is often out of tune, and the instrument-playing is riddled with imperfections. But the tape captures well a time in my life and experiences that I can never forget. The faults and imperfections reveal much about what we tried to express, our doubts, our isolation and alienation, our vulnerability. Originally released by Mirth And Merriment Productions. Re-released by Harsh Reality Music. Dopamine, which is a neurotransmitter, allows nerve cells in the brain to send messages to each other. The imbalance of this chemical affects the way a person's brain reacts to stimuli--which explains why a person with schizophrenia may be overwhelmed by sensory information (loud music or bright lights) which other people can easily handle. This problem in processing different sounds, sights, smells and tastes can also lead to hallucinations or delusions. Did I treat the children right? How long would the words come?